I’ve finally gotten past the lack of motivation that’s been plaguing me for weeks and I’ve returned to books that are much more informational and full of substance. So I picked up this book – Guilt, Shame, and Anxiety. The title sounded appealing – most of my clients come in discussing one or a combination of those emotions. It seemed to have potential in terms of helping me to find new strategies for assisting clients. Looking back, I feel deceived. I wasn’t even through the first chapter when I stopped and thought, “What the heck am I reading? ?” Now, don’t take that to mean that the information being presented was completely ludicrous or utter nonsense. No, that wasn’t the case – it was just not what I had expected when I picked up the book. 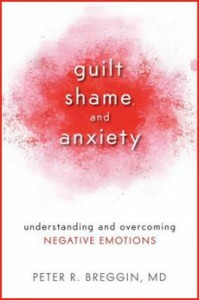 Guilt, Shame, and Anxiety focuses on the evolutionary basis for these negative emotions and it totally caught me off guard. I really think that a more appropriate title for this book would have been ‘The Evolution of Negative Emotions’…maybe that title was taken though. Don’t get me wrong, I do find evolutionary psychology to be very interesting. However, I found this book to be extremely repetitive, inundated with metaphors and, at times, minimizing of the experience of shame. I actually couldn’t finish this book…that rarely happens, but I felt like I was reading the same things over and over again. I also didn’t get a sense that the book was ever going to reach the point of describing how to overcome negative emotions – the title’s promise that had drawn me in. I would not suggest reading this book unless you have an overwhelming passion for discussions of evolution or you need repetition to drive home the information you’re reading. I would imagine that there are much more informational books out there on the subject of guilt, shame, and anxiety.